[The shepherds] hurried to the village and found Mary and Joseph. And there was the baby, lying in the manger. After seeing him, the shepherds told everyone what had happened and what the angel had said to them about this child. All who heard the shepherds' story were astonished, but Mary kept all these things in her heart and thought about them often. The shepherds went back to their flocks, glorifying and praising God for all they had heard and seen. It was just as the angel had told them. If we allow the birth of Jesus to touch us, it can produce the same three types of reactions in us as for those who were originally touched by it. The villagers were astonished at the story — and so are we, because God would love us so much that he sent his son. 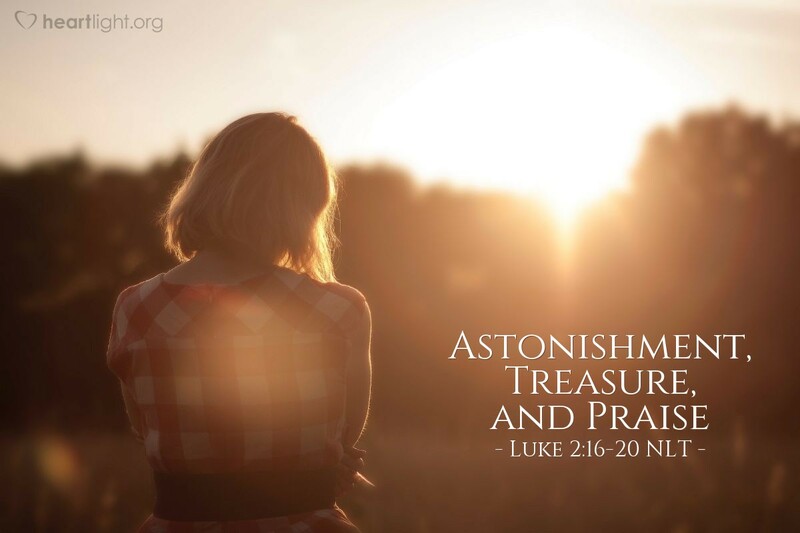 Mary stored the words and events in her heart like a treasure — and so do we, when we read the story of Jesus with love, joy, and anticipation. The shepherds returned to their work, but they did so with joy and praise knowing that their world would never be the same. God has come and visited us. He has shown us his love. He has ensured us that life doesn't have to have its normal boundaries. So we greet this story and this child with astonishment, taking in each event and every word as a treasure while offering our heartfelt praise to God for his gracious love. O Almighty God, so majestic and yet so accessible, thank you for drawing near us when we could not draw near you. In Jesus' name. Amen.